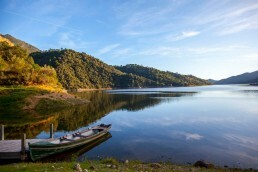 After the Junta de Andalucia’s decision to ban swimming, boating and all recreational activites on the La Concepción reservoir – after the discovery of the Phormidium cyanobacterium – they have been quick to assure the public that tap water is safe to drink. La Concepción reservoir provides drinking water for Marbella, and although the deaths of at least six dogs at the public access to the lake on have still to be officially attributed to the cyanobacterium (more tests are being carried out), the Junta issued a statement that Marbella’s drinking water has not been effected. In the meantime the Junta is now taking samples from other deposits and reserviors in the area including Guadaiza, Guadalmina, Guadalmansa, Nuevo del Angel, Viejo del Angel, Lagomar, Las Medranas, La Leche and Cancelada. Two dogs died at Nuevo del Angel (Turtle Lake) recently, and the samples will be determining whether the cyanobacterium is to blame.